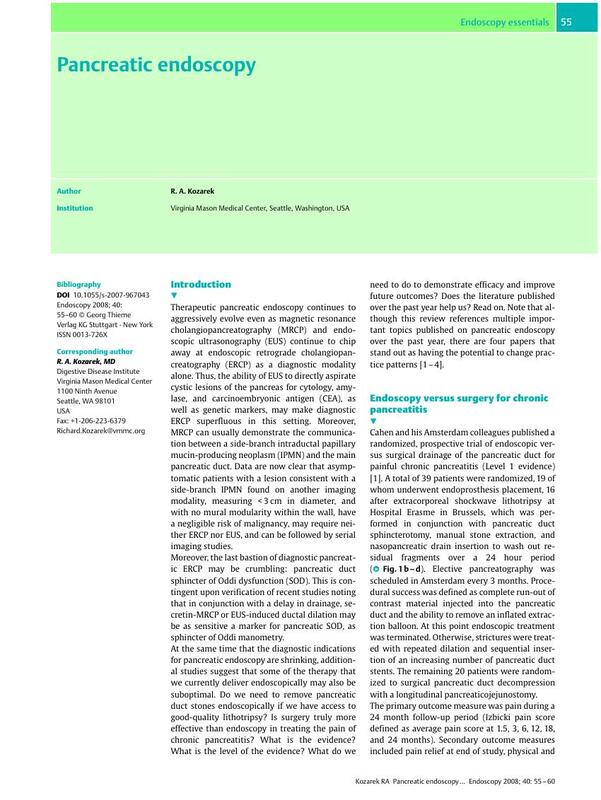 Therapeutic pancreatic endoscopy continues to aggressively evolve even as magnetic resonance cholangiopancreatography (MRCP) and endoscopic ultrasonography (EUS) continue to chip away at endoscopic retrograde cholangiopancreatography (ERCP) as a diagnostic modality alone. Thus, the ability of EUS to directly aspirate cystic lesions of the pancreas for cytology, amylase, and carcinoembryonic antigen (CEA), as well as genetic markers, may make diagnostic ERCP superfluous in this setting. Moreover, MRCP can usually demonstrate the communication between a side-branch intraductal papillary mucin-producing neoplasm (IPMN) and the main pancreatic duct. Data are now clear that asymptomatic patients with a lesion consistent with a side-branch IPMN found on another imaging modality, measuring < 3 cm in diameter, and with no mural modularity within the wall, have a negligible risk of malignancy, may require neither ERCP nor EUS, and can be followed by serial imaging studies. Moreover, the last bastion of diagnostic pancreatic ERCP may be crumbling: pancreatic duct sphincter of Oddi dysfunction (SOD). This is contingent upon verification of recent studies noting that in conjunction with a delay in drainage, secretin-MRCP or EUS-induced ductal dilation may be as sensitive a marker for pancreatic SOD, as sphincter of Oddi manometry. At the same time that the diagnostic indications for pancreatic endoscopy are shrinking, additional studies suggest that some of the therapy that we currently deliver endoscopically may also be suboptimal. Do we need to remove pancreatic duct stones endoscopically if we have access to good-quality lithotripsy? Is surgery truly more effective than endoscopy in treating the pain of chronic pancreatitis? What is the evidence? What is the level of the evidence? What do we need to do to demonstrate efficacy and improve future outcomes? Does the literature published over the past year help us? Read on. Note that although this review references multiple important topics published on pancreatic endoscopy over the past year, there are four papers that stand out as having the potential to change practice patterns    .